I will venture to say that most ages and stages can benefit from the After Dinner Walk. When my husband was single he loved to take walks alone (and grocery shop at midnight, but that’s another story). He’d head down to the pier, get some fresh air, enjoy the solitude- or maybe catch up with someone on the phone while he walked. He appreciated the time to think and pray and he just kind of loved seeing the town settle down for the night. When we were first married we’d walk every evening to chat and connect. We’d talk about work and family, plans and dreams. Sometimes we just did a lot of looking at houses and discussing our excessive opinions on landscapes and architecture. We wanted to get to know our hood and smell the barbecues and the eucalyptus trees. When we got a dog, people started approaching us and introducing themselves because I mean, who doesn’t want to pet a pug puppy? And so the walks became a combination of connection with each other and our neighbors, as well as exercise for us and the dog. Then we added a baby in a stroller and eventually real slow walks with a wobbly and curious toddler. Then another baby, and sometimes that walk was my only trip out of the house that day. Often the after dinner walk was key to surviving the hours before bedtime. 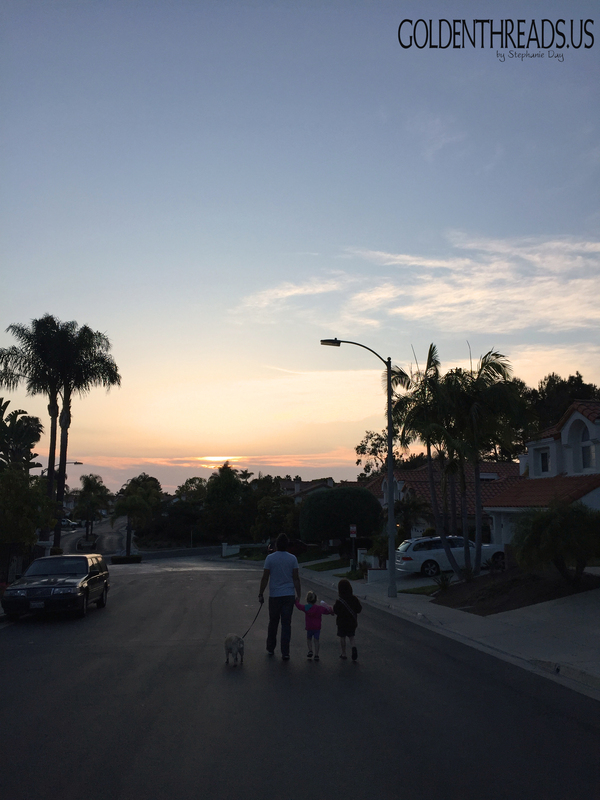 These days our walks involve trying to keep the kids out of other people’s yards, telling silly stories, trying to walk on curbs, marveling at the sunset and collecting leaves and sticks. I know this time will continue to change as we change, but even when we have moody teenagers and eventually an empty nest, I still want to take After Dinner Walks. We’ve gone in seasons with our commitment to this rhythm, but whenever we get back on the wagon I always wonder why we let something so precious slip away. There are (maybe) five days a year here that we have a weather excuse. More often it’s because we’re too “busy” and way more often than that it’s because we didn’t think ahead. I didn’t have a plan for dinner, we ate late, kids needed a bath, kitchen was a mess, it got dark, etc, etc. During these past couple of weeks, life has felt like an exhausting trudge through the mud. I’ve been discouraged, frustrated at myself for getting angry at the kids, overwhelmed with work to do and overall just feeling like I can’t catch a break. And you know, life just gets that way sometimes. But I tell ya, these few things are preserving me right now. Iced lattes, these words, and the After Dinner Walk. So I’m glad that we’ve been getting back out there. We need some head clearing, some mood lifting and some stress relief at the end of these whirlwind days. It’s not a replacement for time in God’s Word or a fix-all by any means, it’s just a walk. My husband and I can’t even use it as a time to talk about sensitive things since our kids listen to EVERY WORD WE SAY (unless of course we are asking them to do something.) And it’s not always dreamy. Maybe the kids will still try to drive each other crazy or someone will fall and cry for a while, but the After Dinner Walk is sacred and something about it makes a difference. If you’ve had a hard day, the walk will help. If you and your people are failing to connect, the walk will help. If you’re struggling with depression or anxiety or heartache, the walk will help. If you’re feeling like God is far away and you don’t see His hand, the walk is a good place to start. Don’t make it a big production, just go. However you look, however you feel, just get out your door and take a walk. If you’re short on time, make it a short walk. If you don’t do it every night, big deal. Just do it often. Go on foot rather than bringing bikes & scooters. Walking slows everyone down and leaves room for picking up sticks, smelling flowers and talking to neighbors. More conversation happens when you walk. Focus on the solitude or togetherness (whatever you’re out there for). Fight the urge to check your phone, photograph everything or talk to so many neighbors that your people (or yourself if you’re alone) miss out on the attention. Plan and prep your meals ahead of time so that dinner itself doesn’t keep you from taking an After Dinner Walk. Just leave the dishes for later if you have to. There’s more beauty to be had on that walk than in skipping it for a clean kitchen. If you have a family, roommates, guests for dinner, etc. try to get everyone on board. They might not know what great things they’re missing! Needed this. Thank you for sharing and I’m looking forward to doing the same.